As fellow exiled Chinese dissidents, we, Wang Dan and Wu’er Kaixi, China’s No 1 and No 2 most wanted student leaders in the 1989 Tiananmen student movement, condemn in the strongest possible terms Britain’s treatment of fellow Chinese exile and dissident Shao Jiang in London. Shao Jiang, 47, was manhandled and arrested for peacefully protesting, tank-man style, Xi Jinping’s motorcade outside Mansion House, where a reception was to be held for the visiting Chinese president. Shao Jiang’s home was raided by police and his computer equipment was confiscated. We also condemn the earlier arrest of two Tibetans, Sonam Choden, 30, and Jamphel Lhamo, 33, who were dragged away by police for attempting to unfurl Tibetan flags as Xi Jinping’s motorcade passed by. In 1989, it was clear to the world just what the Chinese Communist Party was, and many of us who were not massacred on the streets of Beijing were provided refuge in Britain, France and the United States, among other open, democratic nations. Nothing has changed in the intervening years in China – in fact, if anything, the situation has become worse, as 140 self-immolations by Tibetans show. Sadly, however, if China remains as autocratic and intolerant of dissent as ever, the world, it appears, has changed. Today, China’s unelected leader, who presides over a regime that incarcerates human rights lawyers and defenders of women’s rights without trial, is feted by world leaders wherever he goes. Trade takes priority over basic human rights, and exiled protesters with legitimate grievances with the Beijing government are now no longer safe even the democracies that gave them refuge. We regret that Britain is becoming the worst offender. In a desperate scramble to secure business deals with a totalitarian regime, Britain is sadly lending legitimacy to a regime with no rule of law, no freedom of speech, and with geopolitical ambitions that threaten the security of its neighboring nations – and perhaps the world. 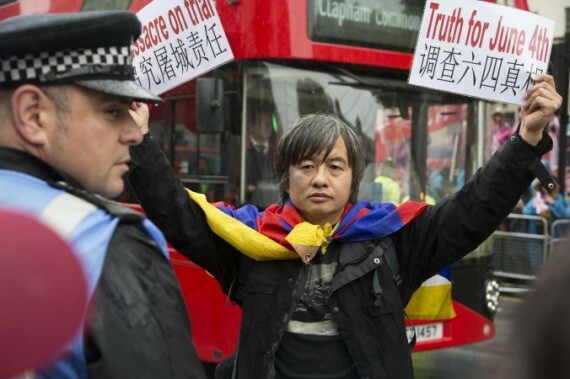 There are those who might say that Shao Jiang was rightfully arrested for attempting to interrupt the motorcade of an eminent head of state, but speaking as victims of Beijing’s systematic repression, we, Wu’er Kaixi and Wang Dan, maintain that Britain’s actions, both in welcoming Xi Jinping and arresting his opponents can only be described as shameful.